Founded in 1987, ARTICLE 19 is a human rights organisation, which works towards a world where all people everywhere can freely express themselves and actively engage in public life without fear of discrimination. ARTICLE 19 works by focusing on two fundamental freedoms: The freedom to speak and the freedom to know, and acts as one voice whenever, and, with teams based in major cities all over the world, wherever these freedoms come under threat. Our mission as a business; the purpose towards which we all work, is to create a more sustainable and equitable world. So, it was truly an honour for us to support ARTICLE 19 in raising the profile of the important work that they do towards this. 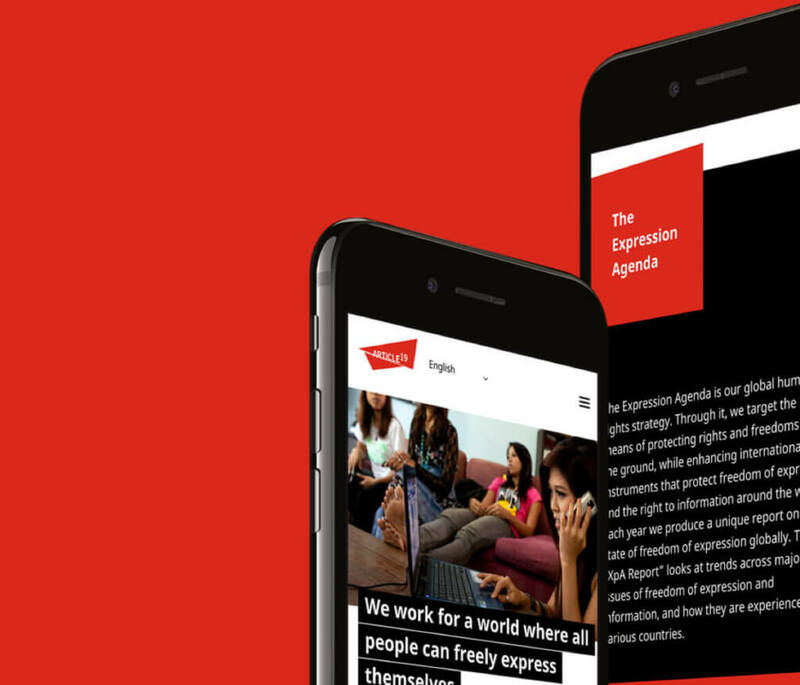 When we started working with ARTICLE 19, they had a website that was out of date and, as they were unable to add or update new content themselves, lacking in recent information about the amazing work they do. 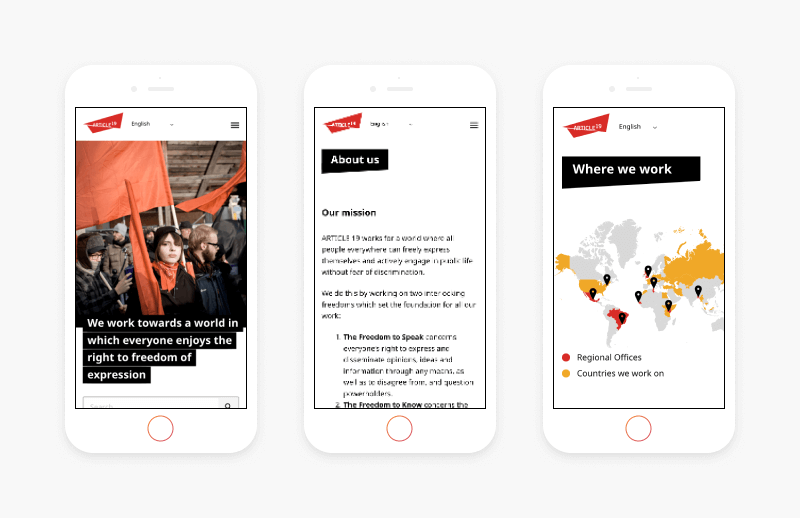 The team at ARTICLE 19 asked us to create a brand new site that would better explain who they are and what they do, and be easily accessible by their audiences around the world. 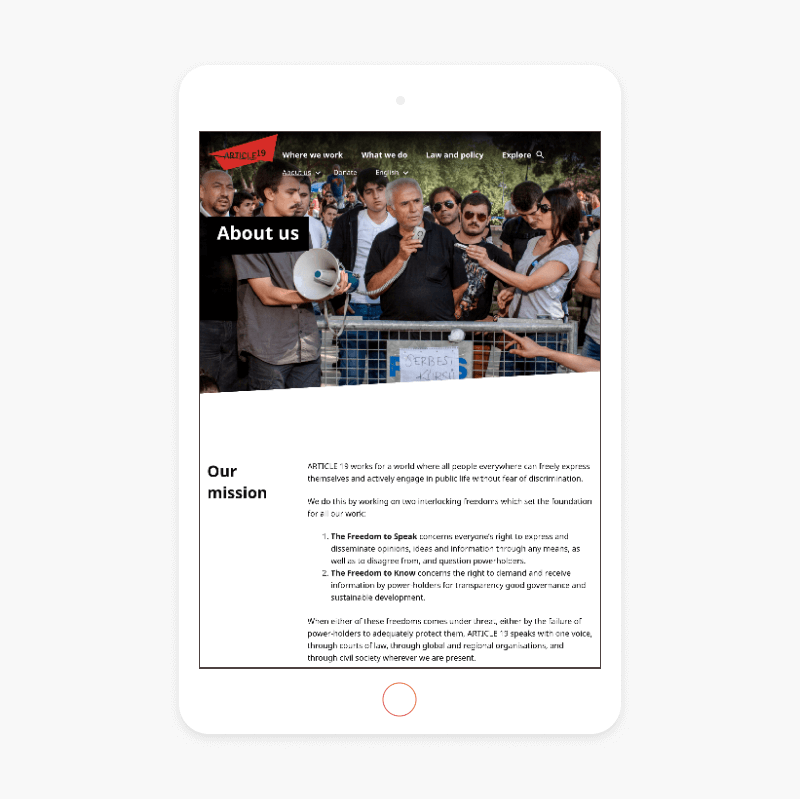 Working closely with ARTICLE 19, we designed a more modern website that would be visually striking, without undermining the seriousness of the work that the organisation does. As many of the site users are based in countries with data limits, our designs needed to be low bandwidth without compromising on quality. We achieved this with bold use of colour and contrast, and minimal use of well placed images. The new homepage design makes the organisation’s purpose immediately clear, and highlights the latest news on recent campaigns and achievements. We restructured the navigation to make it easier to find further information about who they are and what they do, and we added a map so that people can quickly see where they work around the world. The map’s interactive function allows visitors to select a region, taking them to a new page where they can learn more about the focus in the area and the work ARTICLE 19 is currently doing. To reflect the global nature of the work ARTICLE 19 does, we created a multilanguage website, which allows the various teams around the world to publish articles in up to 12 languages. While the majority of the site’s content is in English, we integrated google translate so that all articles can be read in the user’s preferred language, making it more globally accessible. 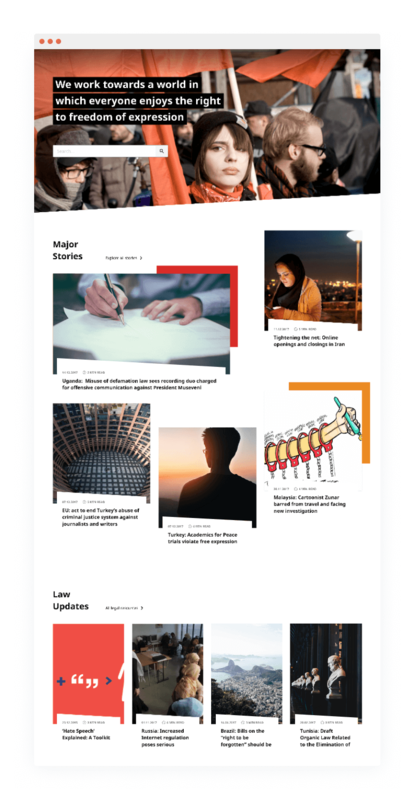 Due to the scope of their work, ARTICLE 19 has an enormous amount of detailed content on specific issues, which each have very niche audiences that could not be targeted via the standard navigation menu. To make sure that all visitors to the new site can easily find the exact information they are looking for, we used Algolia search make it easy to filter items by category, region, content type, year and language. This search function, which we made much more prominent, will even pick up typos and produces instant, accurate results. To make it easy for the ARTICLE 19 team to update the website themselves with the wide range of new content they generate, we added an Advanced Custom Fields (ACF) page builder. This allows the team to create new pages with custom layouts, to meet their content needs. The result is a modern, easy to navigate website, which showcases the wonderful work that ARTICLE 19 is doing across the world to protect our basic human rights of freedom of expression and information.